Resistance bands are a great way to stay in shape while traveling, while doing home workouts, or simply for those who are just starting with their workout routine and may not want to use free weights or machine weights. Resistance bands can easily be transported or tucked away in a drawer, so they’re a convenient way to get in shape. The great news is that you can do just about all the same moves you would do with a free weight training program with resistance bands. If you want to get your upper body into shape quickly, the following 10 minute resistance band workout is for you. It combines strength building exercises along with fat burning cardio intervals to help you firm up and increase muscle tone. Before we get into the workout routine, let’s talk about frequency. Ideally you’ll want to perform this workout three days a week for maximum results, taking one day off between each workout session. However, if you are also training lower body workouts or are doing other forms of exercise, twice per week will suffice. Aim to go no fewer than two times per week however as you need this level of frequency in order to see muscle strength progress. 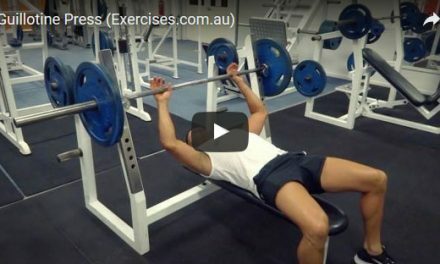 The exercises that make up this program are going to hit all of the major muscle groups and include some compound exercises as well as some isolation exercises. This will help ensure that you are both building maximum strength while also bringing out the muscle shape that you desire. Note that you’ll be doing compound exercises to start with and then gradually moving into the isolation moves as you progress through the workout session. This helps ensure that you are able to push hardest on those strength building moves (the compound exercises) and then tire yourself out with the moves that isolate just one target muscle. Avoid re-arranging the exercises in this workout routine or you’ll lose the effect that the workout is designed to create. Finally, also included are some cardio fat blasting exercises. These will be placed in between the resistance band exercises to help ensure that you keep burning fat rather than having you simply rest between sets. If you prefer alternate cardio exercises, feel free to switch those in as you go. As long as they get your heart rate up and do allow your arms some rest and recovery between the resistance band sets, you’ll be all set. Below you’ll find your 10 minute resistance band arm workout routine. Be sure that you start this workout with a five minute warm-up consisting of light cardio activity or dynamic stretches. Then finish off the workout with a brief cool-down to get your heart rate back to normal and ensure that you aren’t developing excess stress or tension in the muscles that will lead to soreness the next day. To do this workout, you’ll want to aim to perform 10-15 reps of each exercise, doing as many as you can do using proper form until your each the point of fatigue. Then after each set, move into 30 seconds of cardio training. After that cardio is up, you’ll go directly into the next strength building exercise. Continue on this pattern until the circuit is completed and then rest for 2 minutes before repeating through one more time.